Rutgers, my alma mater, is the state university of New Jersey. For many years, the school had a perception problem. While Rutgers enjoyed a strong reputation academically, athletes from New Jersey often went out of state. That began to change in the past decade or two. Recently the school has taken a huge leap in its ability to attract the state’s top student athletes. All that progress is now threatened by the mishandling of the current crisis involving head basketball coach Mike Rice. Clearly, the administration failed to understand the seriousness of the problem when it first came to light months ago. Rutgers made some classic crisis communications mistakes. Now its reputation will endure long-term damage unless it takes some important steps to manage the crisis. To review, last November the Rutgers athletic director received a video from a former athletic department employee showing Rice physically and verbally abusing players at practice. The AD suspended the coach for three games and fined him $50,000. He also required Rice to attend anger management training. In March, the AD said that the coach would be back next season. Last night, ESPN’s Outside the Lines played the video. Viewers were shocked. Politicians (Rutgers gets state funding) were outraged. Sportswriters demanded the firing of the coach, the AD and the school president amid questions about why parents would send their kids to Rutgers after this. The crisis might have been avoided if Rutgers had handled it better months ago. Letting it linger only made it worse. If the administration had conducted a more thorough investigation, handed the coach a stronger punishment, and made significant changes in the athletic program, it might have avoided the situation it finds itself in today. Which is scrambling to put out the fire that threatens to hurt its recruiting as it prepares to enter the big time Big 10 conference in 2014. 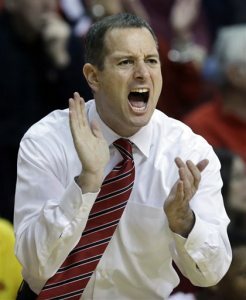 Because Rutgers wanted to protect the reputation of its athletic program, it allowed the reputation of the university to suffer serious damage that could take years to repair. Today the school fired Mike Rice. More heads are certain to roll. The crisis is far from under control. And it all could have been avoided. Every organization is vulnerable to a crisis. Every organization needs an effective crisis communications plan that is adaptable and frequently updated. Crisis communications training should be practiced regularly. But even if those steps are taken, all of that will fail unless the organization is determined to act quickly, responsibly, ethically, honestly and transparently.